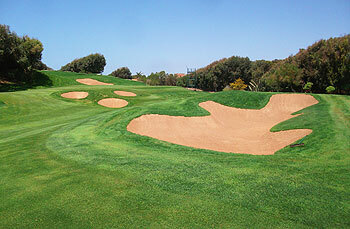 A very private 18-hole layout that you will not find listed in any Moroccan golf directory, the Golf du Palais Royal d’Agadir course is a Robert Trent Jones Snr design that lies within the heavily guarded ramparts of the Royal Palace in Agadir where it made its first appearance to a select few golfers in 1987. In the book A Difficult Par by James R. Hansen, the author reveals that it was Cabell Robinson who actually designed the course, following problems Robert Trent Jones had experienced when he was last in Morocco in the early 1970s. Jones apparently got caught up in an attempt to overthrow the king during a visit to one of his palaces near Casablanca. According to Cabell Robinson: “The palace contacted Mr. Jones about doing a job there and I was sent to look into the matter. The land was beautiful dunes covered with eucalyptus and other scrub and lay between the new palace under construction and the sea. I was told that we had to have the course ready to play within six months! Obviously this was not going to work and I told the head of the palace project that we could probably have the course built and planted within six months but it would not be ready for several months thereafter. This was acceptable… An agreement was quickly signed and we started almost immediately… Things progressed smoothly for several months but then payments ceased and at Mr. Jones’s request we stopped all work and left the site. Situated amongst the sand hills beside the Atlantic Ocean, the fairways of the Palais Royal course are laid out in two returning nines, each of which play to a par of 36. The property may be located close to the shoreline but the high security walls that surround the palace keep the outside world at arm’s length, even at holes 3 and 4, the two par fours that are closest to the ocean on the most westerly edge of the palace grounds. The opening par five hole sets the scene for the round where a veritable sea of sand on either side of the fairway confronts the golfer on the tee. Avoiding those deep and deadly bunkers is the order of the day as the beautifully manicured fairway veers right to a pneumatically jacked up green that’s surrounded by yet more sand. Precision play is essential around here, otherwise the steep run off slopes around the greens will prove very costly – and that’s certainly the case at the two long par threes at holes 2 and 8 where upturned saucer greens repel all but perfectly placed tee shots. The only water-threatened hole on the front nine is the beautiful 580-yard 5th, where the pin is cut behind a couple of ponds to the front left and right of the green. The aquatic challenge intensifies after the turn though, first at the par five 10th, followed by the two beautiful par threes at 12 and 14, where water lurks front and right of both putting surfaces. The course, which hosted the Moroccan Open six times during the 1990s, was used between 2011 and 2015 as the venue for the European Tour’s Trophée Hassan II competition, an event that moved back to Royal Dar Es Salam Golf Club in Rabat from its short-term home in Agadir in 2016. 17th toughest hole was the par three 2nd, playing to a length of 208 yards. The average score was 3.40 and the ratio of birdies or better versus bogeys or worse was 28/155, with Richard Green recording the highest score (7) in the event. This hole’s the first of four par threes on the course, with each of that quartet measuring at least 200 yards. Precision from the tee is key as there are steep run-offs surrounding the raised green. Richie Ramsay managed to card a par at this very difficult hole in each of the four rounds on his way to victory in the 2015 edition of the event. 14th toughest hole was the par four 18th, playing to a length of 484 yards. The average score was 4.43 and the ratio of birdies or better versus bogeys or worse was 31/168, with five players each recording the highest score of 7 in the event. With two fairway bunkers down the right and a raised green that cants markedly from back to front, there’s lots for players to contend with on the finishing hole here. With many of the players posting bogey figures or worse, Pelle Edberg and Matteo Manassero somehow managed to shoot two under on this hole during the week. I was fortunate enough to participate in the pro-am at the Trophée Hassan II a couple of weeks ago and was completely blown away by the quality of this course. Perfectly manicured fairways, fantastic bunker complexes and wonderfully contoured greens made this one of the best (and toughest) tracks that I’ve ever played. I wasn’t over enamoured with the last RTJ course I’d encountered - Ballybunion (Cashen) in Ireland - but this offering from the old master had me in raptures from start to finish. You know you’re in for a serious test of golf on the doglegged first hole (stroke index 2) when you see how many enormous bunkers are in play between the tee and a seriously elevated green. The 2nd tee is one of the highest points on the course and it’s from here as you look around that you can see just how undulating the course really is. The five par threes on the Royal Palace course are all tantalising, but testing short holes - only the 14th hole measures less than 200 yards - though my favourite hole on the card was the 580-yard par five 5th, which starts off in high ground amongst the dunes before plunging downhill to a fabulous green perched behind protective ponds on either side. I’m not normally a big fan of water holes but this one just fitted the land so effortlessly. On the back nine, the par three 12th is regarded as the signature hole on the course and it’s a real beauty, played across wetlands and water to a two-tiered green. Our group of three all managed a par but I noticed on the PGA website after the Hassan Trophy event was over that the pro I played with had taken a NINE on the third day (to follow a 7 he'd had at the par four 11th), scuppering any chances of a good finish in the competition – it just shows how even top golfers can come to grief at such a beguiling hole. Not many non-professionals get to play here so it was a real privilege to get the chance to do so and if the Royal Palace course is the standard to which Robert Trent Jones Snr carried out all his work in Morocco, then I really need to return some day to measure it against his 45-hole complex at Royal Dar Es Salam in Rabat. It was a few years after playing here that I discovered RTJ didn't create the course at all -- it was all done by his associate Cabell Robinson, who has designed a number of very fine courses in Morocco. The original article has since been changed to reflect this fact. The course remains one of the top ten that I've ever played (but I've still to play the Red or Blue layouts at Royal Dar Es Salam, though I've walked them a couple of times).